Intelligent Safety System for protection. The complete range of the MIT Series provides indication of insulation resistance up to 999Mohms, 200mA continuity testing, and a fast-reacting continuity buzzer. The MIT300 Series replaces BM100/BM120/BM220 Series. 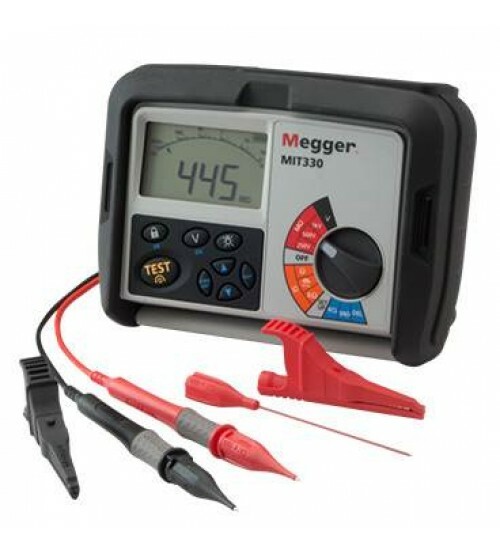 Developed, after extensive customer research, specifically to meet the needs of today’s electrical contractors, the new MIT300 range of insulation and continuity testers from Megger is not only durable and easy to use, but also incorporates a comprehensive set of features designed to ensure operator safety, even under conditions of accidental misuse. An illuminated switched test probe is available as an optional extra for use with the MIT320. The MIT310, MIT320 and MIT330 testers incorporate dual solid-state displays which simultaneously show the test results numerically, and in the form of a moving-arc bar graph that accurately simulates the operation of an analogue meter. The MIT330 additionally offers the facility to save test results to internal memory. Over 1000 result can be saved on site, and downloaded to a computer when convenient. A memory bar graph acts as a ‘Fuel Gauge’ showing how much memory has been used. Test results are downloaded to CSV (Coma Separated Variable) spreadsheets. If certificates or reports are required, the results can be downloaded directly into Megger Powersuite Professional with a range of features for creating professionally finished documentation.